On the day that Ken and Carol Borland’s lives changed forever, hundreds of pickups jockeyed for space outside the couple’s West Glover homestead. Hulking American-made trucks, many with livestock trailers in tow, filled the farm fields and choked the road below their house. 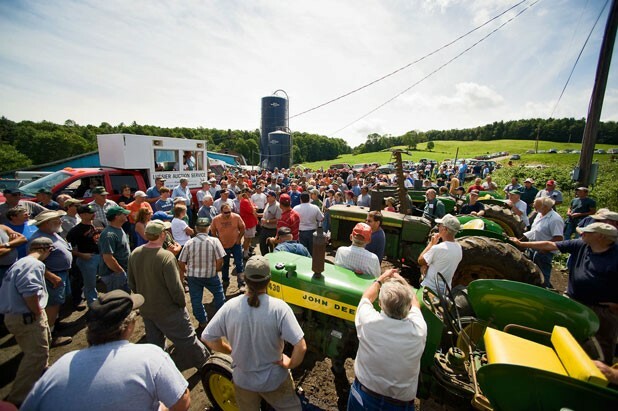 The Borlands knew to expect a huge turnout — to date, theirs was the biggest farm auction of the year in Vermont — but all those vehicles and the people who drove them there were still an overwhelming sight. By the time Reg Lussier, the Lyndonville auctioneer hired to disperse the 144-year-old Borland farm, called out the first item at 10 a.m. sharp, the couple’s property was a sea of steel and Carhartts. Farmers from every New England state, as well as New York and Pennsylvania, had descended on the 400-acre dairy farm to bid on everything from bailers and tedders to calves and heifers. The Borlands were getting rid of it all — 140 Holsteins, five John Deere tractors, forage wagons, blowers, a seeder, a dump truck, 800 bales of hay and more. In all, hundreds of thousands of dollars’ worth of equipment and livestock was on the auction block. In bad economic times, farmers will travel great distances to get a good deal. The Borlands wandered through the crowd as the auction began — Carol looking beatific in the mid-morning sun; Ken with a stern, almost wistful expression on his face. It was a day they dreaded, but now that it was upon them, they faced it with the dignity and pride characteristic of Vermont dairy farmers. Because of extreme fluctuations in milk prices, the couple had determined they could no longer keep the farm afloat. At best, it was barely breaking even. Their debt load was substantial. They were getting too old for this, they lamented. When a maple-producing neighbor offered to take 200 acres off their hands, the couple took them up on it. The Borlands are among the many victims of Vermont’s flagging dairy industry. In the past five years, the state has lost 250 dairy farms. In the last 12 months, 50 Vermont dairy producers have gone out of business. According to the Vermont Milk Commission, the year-to-date income drop for the state’s dairy farms is estimated at $116 million. At the moment, farmers are receiving $11.30 per hundredweight, the standard measurement in the dairy industry, which amounts to 11.6 gallons of milk. That hundredweight costs Vermont farmers nearly $19 to produce, for a net loss of $7.70 per unit. Every time a milk truck leaves the farm, the dairying family hemorrhages money. It could be argued that the Borlands are lucky. They’re not being foreclosed upon, and no banks have claims on their property. The couple owns their farm outright. They’ve chosen to leave agriculture of their own accord in an effort to return to financial solvency. Carol Borland, 65, said she’s relieved that they’ll no longer have to worry whether they can pay their veterinarian, their fuel provider, their feed man. The same cannot be said for many of the couple’s peers. To understand how the Borlands got to this place, it’s important to know something about the “dairy crisis,” as Vermont’s congressional delegation is calling it. It’s not new, for one thing. Over the years, the dairy industry has ricocheted between boom and bust times, largely because of an antiquated and complicated pricing system. Diane Bothfeld, dairy policy administrator for the Vermont Agency of Agriculture, offered to explain it, but admitted that the lesson would probably take two hours. Instead, she submitted three reasons why the dairy industry is collapsing, not only in Vermont, but in other dairy-producing states as well. During 2007 and 2008, exports of dairy products reached 11 percent of the milk supply. In those years, farmers received between $17 and $19 per hundredweight for their milk — a fair amount given the cost of production. As countries such as Mexico, Indonesia and China grew more prosperous, they began adopting a more American-influenced diet rich in dairy products. When the economy started to slip in late 2008, so did the international importation of American milk. Exports dropped to just 5 percent of the milk supply. In the first quarter of 2009, farmers’ wages dropped from $17.77 to $11.63 per hundredweight. As of July, farmers were earning around $11.30 per hundredweight. Coupled with the downturn in the international economy was the melamine scandal in China. Several Chinese companies were doctoring their milk with melamine, an agent that causes poor-quality milk to appear to have a higher protein count. Hundreds of thousands of people became sick due to the tainted milk, and Chinese consumers all but abandoned dairy products regardless of provenance. Due to the drop in milk exports, the U.S. found itself with a massive milk surplus. Once production is ramped up to accommodate foreign demands, “it’s hard to back it off,” Bothfeld explains. She calls the situation a “torture cycle” for dairy farmers. In order to get milk pricing back in line, supply has to be decreased. The only way to achieve that is to slaughter dairy cows for beef. A program called CWT — Cooperatives Working Together — aims to do just that. So far in 2009, five Vermont dairy farms have taken part in CWT’s “herd retirement” program. But many farmers, like Ken Borland, don’t want to see the cows they have reared and cared for go to the slaughterhouse. For that reason, the number of Vermont cows in production has changed little in the past few years. In 2007, there were about 140,000 milkers in the state. Today, there are about 135,000, which so far this year have produced 838 million pounds of milk. In 2008, Vermont cows produced 2.6 billion gallons of milk. The third reason for the dairy crisis, as Bothfeld sees it, is that recession-sensitive Americans have become more cautious with their money. People aren’t going out to eat as much and have scaled back on purchases of premium goods. Other issues have contributed to the near crippling of the dairy industry in Vermont: last year’s sky-high fuel prices, the collapse of the commercial credit market, and the explosion of grain prices due to the ethanol boom, to name a few. The necessity of managing so many unpredictable factors has made conventional dairy farming increasingly unsustainable. It takes a lot to rattle unflappable dairy farmers. Every day, they’re forced to deal with problems beyond their control — milk prices, consumer demand, the weather — and, regardless of what else is going on, the cows still need milking. Because they accept the harsh realities of the job, not too many farmers at the Borland auction got misty over yet another farm disappearing. During the bidding, some folks talked about the closing, but most just kibitzed about the federal government’s emergency milk price supports and how Sen. Bernie Sanders is going after Dean Foods, the nation’s largest milk processor, for possible antitrust violations. Francis Berwick, a former dairy farmer from Peacham, views Ken Borland as another casualty in the dairy crisis, a human face on the statistics. “This don’t surprise me one bit,” he said. Berwick left the milk business 15 years ago because of the uncertainty, but the retired farmer still likes riding in tractor parades. He came to the auction in hopes of picking one up for his collection. He doesn’t blame the Borlands for getting out of dairying, but he wishes things were different for his fellow farmers. Ed Skwira retired early from UPS, then started raising beef in Rutland. “I should have had my head examined,” he joked of his late introduction to agriculture. He came to the auction looking for a tedder, and to observe the spectacle. Skwira said he felt some guilt for getting a deal on the equipment. “It’s just really sad that people can’t do this for their life anymore,” he said. During the auction, the Borlands’ property had the feel of a country carnival. Around the bidding area, the air smelled of French fries and manure. A concession stand next to the barn sold hot dogs and hamburgers, which the farmers had no trouble eating at 9:30 in the morning. Potential bidders walked from item to item, kicking tires and examining movable parts. Old farmers in sun-bleached feed caps jawed about business and family, while children in muck boots raced around the fields. The auctioneer’s amplified voice echoed in the valley below the farm. For those farmers who hang on, two temporary federal programs will soon be available to help stanch their losses. In late July, U.S. Department of Agriculture Secretary Tom Vilsack announced that the USDA would temporarily increase the amount of money it will pay for cheese and nonfat dry milk. In tough times, the agency buys milk to help clear commodity dairy markets through its Dairy Product Price Support Program. According to the Vermont Agency of Agriculture, this program has the potential to add up to $1.50 to the hundredweight price paid for milk. On August 4, the U.S. Senate voted to provide an additional $350 million for milk price supports for government purchases of surplus dairy products. That bill was sponsored by Sen. Sanders and supported by the rest of the state’s congressional delegation. At a meeting with dairy farmers at the recent Addison County Fair & Field Days, Rep. Peter Welch praised his colleague’s work, but admitted it doesn’t go far enough. “I understand that’s not what you need, but at least it’s an acknowledgment,” he said. Part of the problem, Bothfeld said, is that while Northeastern politicians have been lobbying since the beginning of the year for emergency assistance for dairy farmers, lawmakers in the Midwest and Western states weren’t convinced there was a problem until recently. Because the cost of production in the Northeast is higher, the tumbling milk prices had a more immediate effect on farmers here than it did in big dairy states such as California, Wisconsin and Idaho. “It did take time for the rest of the country to see this and then it was, like, Oh, my God. This is real,” Bothfeld said. In an ideal world, Bothfeld envisions a dairy system where all consumers could buy local milk from local cows that has been processed locally. For every gallon of milk produced, middlemen, like Dean Foods, currently take $1. Farmers earn about 97 cents. Although the company’s gross revenues have dropped this year, its profit doubled in the first quarter of 2009, compared to the same period in 2008: That’s $76.2 million versus $30.8. Bothfeld would like to see farmers earn a liveable wage, akin to a domestic fair-trade system. While that would cost more, the benefits to the local community are higher, she said. In the absence of that one-to-one arrangement, Bothfeld pointed to processors that pay premiums for milk. Grafton Village Cheese Company in Grafton and Thomas Dairy in Rutland both choose to pay their farmers 50 cents to $1 more than the $11.30 per hundredweight they’re making now. While that might seem like just a gesture, it’s more than the farmers would have made otherwise. Ben & Jerry’s, which gets its milk from the St. Albans Cooperative Creamery, has instituted an interest-free revolving loan of up to $100,000 to help struggling dairy farmers in lieu of paying them more than the base price. Until consumers and farmers can cut out the middlemen, Bothfeld would settle for a complete overhauling of the milk-pricing structure. By the end of his farm auction, Ken Borland had watched prized milkers such as Guilia, Hillary, Dottie and Dawn — all daughters of top sire Toystory — get divvied up among farms along the Northeastern seaboard. “Some of the cows, it was hard to see them go,” he said. “They’re living creatures.” But, as would be expected of a farmer who’s worked 80-plus hours a week his entire life, Borland didn’t have time to be sad. There was still work to be done after the auction. Cows still on the farm needed to be milked, and all the financial details of the auction were still being worked out. Despite the drama, Borland still seemed content with his decision to quit the dairy farming business. After being forced to let his hired help go, he said he just didn’t have the energy to run the farm on his own. “My body’s been telling me that I can’t keep doing this all my life,” Borland said. As the auction neared its end, the Borlands stood next to each other against the bars of a makeshift ring. They watched as their milkers — Betty, Wendy, Nancy, Agnes and the others — were led into the pen one by one and shown off to prospective buyers. Lussier, the lightning-tongued auctioneer, called out bids, while his ringmen pointed out the bidders with crook-handled canes. The cows were understandably nervous, and some bucked and juked when they entered the ring. One cow froze and refused to walk through the shoot to the ring. Instinctively, Ken Borland stuck his hand through the bars, patted the cow on her black-and-white flank and urged her on through.